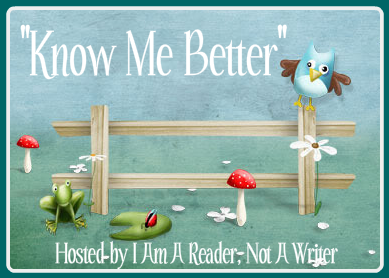 This fun weekly meme is hosted by Kathy from I Am A Reader, Not A Writer. I saw her post, thought it looked like fun, and decided I wanted to take part in it. Each week she will answer 5 questions from her author interview list. She turned it into a meme so that everyone can participate and link up our posts! So let's get to know each other better! I would have to say both. The spotlight because I used to do community theater. I say used to because the last play I was in was Shakespeare's Timon Of Athens. I was 2 months pregnant at the time, and I haven't been able to audition for anything since then. I would really like to get back into it soon though. I am also a shadow lurker because blogging is a pretty "behind the scenes" thing and I mostly just stay home and blog, read, and take care of my daughter! Oh, man. Wayyy to many. I have probably at least 200 physical books at home that I haven't read. Plus all of the books that I am eagerly anticipating and are on my TBR on Goodreads. I'll just say that I will never be able to read everything I would like to. It's about picking and choosing and hoping you read the best ones! Right now I am reading Splintered by A. G. Howard(review to come). Next I think it has to be The Essence by Kimberly Derting because I have to review it for a blog tour. Well, I shouldn't say have to, because I really enjoyed The Pledge and am excited to see what happens next! Now it's your turn! Share an answer to one or more of these questions as a comment or post your answers on your blog and link up here! You can grab the linky code and add it to your post if you would like.